Chanteur Anglais né Frederick Heath, le 23 Novembre 1939 à Willesden (Londres). 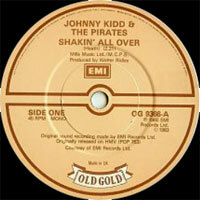 Johnny Kidd forme son premier groupe "Freddie Heath And The Nutters" et début 1959, "Johnny Kidd And The Pirates" qui enregistrent en Mai leur premier album. Il devient alors l'une des grandes attractions de la scène Rock Britannique avec un show violent et théatral. En Avril 66, les "Pirates" se séparent et Johnny engage les "Régents". 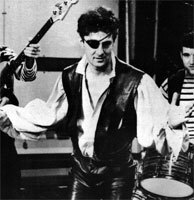 Johnny Kidd est mort le 7 Octobre 1966 à Radcliffe, à 26 ans, dans un accident de voiture. 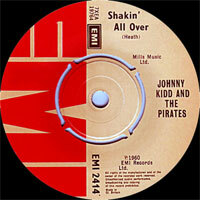 One of England's top rock & roll outfits before the Beatles led the early-'60s Beat Boom, Johnny Kidd & the Pirates are best remembered today for one international rock classic ("Shakin' All Over") and as a seminal influence on several more famous groups, most notably the Who. Johnny Kidd (born Frederick Heath) had formed his first band, a skiffle group called the Five Nutters, in 1957. 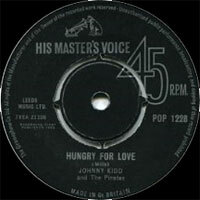 They quickly outgrew their skiffle roots and, after a short period fronting the Fred Heath Combo, he joined Alan Caddy (guitar), Tony Docherty (rhythm guitar), and Ken McKay (drums), in early 1958 in an outfit that was dubbed Johnny Kidd & the Pirates, who were spotted by an EMI Records representative and signed to the label. 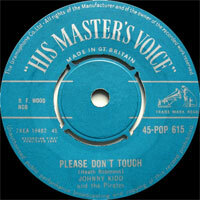 The group cut their first record, the outstanding Please Don't Touch, in April 1959, highlighted by Heath's menacing Vocalss, which reached number 26 on the British charts. The group's subsequent records were an uneven mix of solid R&B-based rock juxtaposed with awkwardly covered standards. In May of 1960, however, the band was in the studio to record one of those standards, "Yes Sir, That's My Baby," with an original B-side that they hadn't fully worked out. 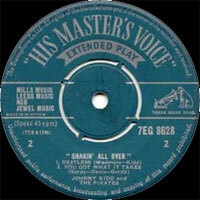 That B-side, a Heath original called "Shakin' All Over," became the A-side of a number one single that became the first original rock song in England to achieve the status of an international rock standard. Driven by Caddy's guitar and a mournful, ominous lead Vocals by Heath, the song topped the charts and completely astonished everybody who heard it that such a track could have come from an English rock & roll band. Unfortunately, like every other British label of the era, EMI was never sure how best to deal with rock & roll success, and the group was made to record any amount of dross in the wake of this success, amid some superb follow-up numbers. Several membership changes followed, most notably the addition of Mick Green on lead guitar. The group was among the finest rock combos of the early '60s, with a wild stage act that had them playing in pirate regalia, but it never had enough consistent chart success to put it back in the top ranks of Britain's rock hierarchy, though they received a great deal of respect from the younger generation of rock & rollers. Early in their career, the Who played on the same bill as Johnny Kidd & the Pirates, and it was through watching the Pirates at work that they arrived at their own sound of a solo singer backed by a guitar, bass, and drums; the band also added "Shakin' All Over" to their repertory. Heath and his band struggled onward into the mid-'60s, even remaking "Shakin' All Over." Green left in 1964 (replaced by John Weider) to take over as a member of the Dakotas, Billy J. Kramer's backup band, and Heath put together a new combo during this period. The mid-'60s seemed to be a more favorable period for Heath's brand of R&B-based rock & roll. He put together a group called the New Pirates, and was about to embark on a new phase of his career, when he was killed in a car crash on October 7, 1966. the New Pirates continued on for a time, with Johnny Carroll fronting the group until mid-1967, when they called it quits. 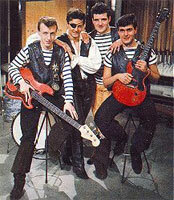 During the 1970s, however, the Pirates, with Mick Green back in the lineup, began playing together again, and they have continued to perform to this day in England, and recorded a handful of albums during the 1970s and '80s, featuring Johnny Kidd-era material as well as new songs in their stage show. Among the New Pirates, bassist Nicky Simper went on to become a founding member of Deep Purple.